Take a self-guided tour of our beautiful churches using this this on-line brochure! Sandy Lake Camping grounds are located about 22 km (14miles) north-east of Willingdon  3 km north and 19 km east. Or easily accessed off Hwy 45 approximately 11 km (7 miles) west of Two Hills on Hwy 45 (at secondary Hwy 631 turn off). Head 11 km (7 miles)north following the curves around the lake to reach the campsite. Here you will find a quiet lake that offers you private and secluded camp stalls. Pavilion, ball diamonds, playground, cook Pavilion rental available by calling County of Two Hills at (780) 657-2052. 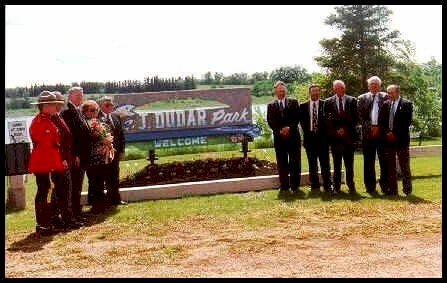 John Dudar Park is tucked away beside Jackfish Lake 11 km south west of Myrnam. To get there you need to travel 3 miles west of Myrnam on Hwy 45 and then 4 miles south until you negotiate a left hand turn at the fork in the road. John Dudar Park was named after the long time councilor of the area and offers you a quiet campsite in the midst of a agricultural backdrop. The campsite houses an open air bandstand that has played host to such acts as Farmers Daughter. Other Gazebo rental, cook shelter, Pavilion rental available by calling County of Two Hills at (780) 657-2052. Two Hills Museum - Ph: 780-657-3512. Address: 5019-51 St.
CAP Site (internet access) - Ph: 780-657-3512. Address: 5019-51 St.
Lac Sante is located approximately 22 km north east of Two Hills. To get there you need to follow Hwy 45 east of Two Hills to Hwy 36 and head North 10 km (6 miles) crossing the North Saskatchewan River. At the first paved road north of the river turn east and follow the Paved black top 8 km (5 miles) and then continue around the curve and head approximately 5 km (3 miles) north until you hit the lake and the boat launch amidst the cluster of private lots. Unfortunately the campsites around the lake are all private but you are able to launch you boat at the County boat launch and take in some of the lakes great fishing. Another place to get away from the everyday. Enjoy some great walleye and pike fishing. The North Saskatchewan River winds through the north end of our County and previously served as the areas lifeline carrying supplies to these once remote communities.. There are many breath taking views and some great fishing in this large, fast moving, mountain fed river. There are many different ways to access the North Saskatchewan river and it's wide variety of recreational potential. A public boat launch in the community of Duvernay along with day camping use at the Desjarlais Crossing are just a few of the locations where this great resource can be accessed. The river valley is also host to a variety of all terrain/horse/walking trails that are maintained by local volunteers and the Lakeland Breakers Snowmobile Club. Enjoy the great variety of fishing in the river but always remember to consult updated regulations for the latest changes in limits and seasons. A Canadian National Park Near Edmonton. Known for it's Buffalo reserve. Located on Highway 16. The site presents stories of Ukrainian immigrants who came to the Bloc Settlement in East Central Alberta between 1892  1930 using role players in period costumes recreating a variety of historical characters during this period. Staff provides tours of the farmsteads, townsite and rural community.The Ukrainian Village is located 25 minutes east of Edmonton on the Yellowhead highway 16 east. The Lakeland Golf Associations has many beautiful and challenging courses through out the region. For up-to-date information on Alberta campgrounds, as well as virtual tours of selected campgrounds visit this site by clicking on their logo.